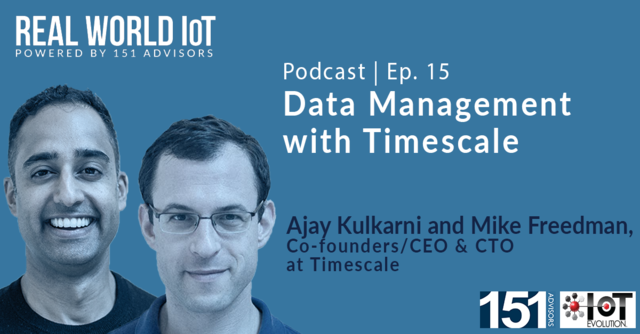 On this week’s episode of the Real World IoT Podcast, host Ken Briodagh discusses the management of IoT data with Co-Founder and CEO of Timescale, Ajay Kulkarni, as well as Mike Freedman, Co-Founder and CTO of Timescale. Timescale is addressing one of the largest challenges in databases for years to come: helping developers, businesses, and society make sense of the data that our machines are generating in copious amounts. Timescale provides the only open-source time-series database that natively supports full-SQL, combining the power, reliability, and ease-of-use of a relational database with the scalability typically seen in NoSQL systems. Problems faced by IoT and smart city opportunities are knowing how all the moving pieces work together to obtain a real ROI! Join Steve Brumer, Partner at 151 Advisors and Steve Wimsatt, Senior Director, Alliances and Business Development Ruckus Networks, a unit of ARRIS for a 45-minute open discussion on IoT in Smart Cities, the real-world applications and uses cases across the globe and how to make money! -Where is the money in supplying products and services and the commercialization aspects of them! - What is the true meaning of ROI in the Smart Cities and Smart Buildings space? Key takeaways will focus on where should you focus your time, energy and efforts within this space and how to drive revenue. Join Steve Brumer, Partner at 151 Advisors and Mark Young, CTO at Climate Corporation for a 45-minute informative discussion on monetizing IoT in Smart Agriculture. This webinar will focus on the Smart Ag landscape, uses cases, opportunities and how vendors & partners can monetize with IoT. Exploring all the business aspects, connectivity, sensors, big data, platforms, and system integration. Key takeaways will focus on where should you focus your time, energy and efforts within this space and drive revenue. You've got firewalls, antimalware, next-generation endpoint security, and NAC. You're rolling out CASB and analytics, and extending protection to cloud, mobile, and IoT resources. But how does it all come together? This webinar reveals what a next-generation security architecture looks like--and which technologies, and vendors, should be part of it. On this week’s episode of the Real World IoT Podcast, host Ken Briodagh discusses where we are seeing growth in the IoT industry with President at Sigfox, Christian Olivier. On this week’s episode of the Real World IoT Podcast, host Ken Briodagh discusses the status of employment and what is like working in the IoT Industry with Executive Recruiter in Wireless & IoT at Trevally Group, Michele Williams. Trevally Group is a recent spin out from the previous firm that Michele worked with, but despite being a relatively new firm, Michele has been recruiting in the Mobile and Wireless Technology industry since about 2007. About 6 or 7 years ago, she began focusing down on a more niche sector of telematics and then to IoT which is now a huge piece on its own. On this week’s episode of the Real World IoT Podcast, host Ken Briodagh discusses how important relationships and partnerships are within the Internet of Things Industry with Chief Data Officer of Procon Analytics, Daniel Walpole. Since coming to the United States, Daniel ran business units and sales organizations for major cellular networks like AT&T, Sprint, and Verizon. Over the last 15 years, Daniel has worked with Verizon Wireless; and for the last 6 or so of those 15, he was in charge of developing the Verizon partner program. On this week’s episode of the Real World IoT Podcast, host Ken Briodagh discusses how partnerships and bundled solutions are shaping the Industrial IoT with Derek Wallace, Director of Product Management at MultiTech Systems. MultiTech designs, develops and manufactures data communications equipment for the industrial Internet of Things — connecting physical assets to business processes to deliver enhanced value. MultiTech has been around for almost 48 years and has been diving deep into low power wireless and will be eventually working on devices with 5G. On this week’s episode of Real World IoT Podcast, host Ken Briodagh discuss the differences between the consumer and enterprise IoT markets and the impacts of “gold rush mentality” with President of the CallPass companies, Jason Ashton. CallPass consists of CallPass Tech and CallPass M2M Solutions Inc, both of which specialize in asset tracking through GPS technology, working directly with consumers and enterprises alike. On this week’s episode of Real World IoT, Ken Briodagh speaks with Vice President of IoT for Avnet, Lou Lutostanski. In this role, Lou works across the company to identify and create opportunities to leverage Avnet’s capabilities and expand the company’s reach and expertise to entrepreneurs, startups, leading technology OEMs and other IoT innovators, enabling them to bring IoT solutions to market, from idea to production. Lou has 30 years of experience and industry knowledge, joining Avnet in 1987 as a system sales manager. Throughout the next 13 years, he gained increasing responsibility as a field application engineer, sales manager, branch manager, and vice president, area director. Throughout his most recent years at Avnet, he served as vice president of sales for the Americas and as vice president of demand creation for the Americas. Creating Immersive VR, AR and 3D Experiences Using Amazon Sumerian. Consumers are desiring more immersive and engaging experiences, but developing such experiences can be challenging and costly. Amazon Sumerian strips away this complexity by making it easier, faster, and less expensive to develop and deploy AR, VR, and 3D applications. Join us for an overview of the Sumerian IDE, console, editor and hosts as well as renderings of demo use cases. In this hands-on webinar, participants will learn how Sumerian’s browser-based approach to application development is being used to create and publish scenes. Kyle is the General Manager of Amazon Sumerian. Kyle was the founder of 2lemetry which was acquired by Amazon in 2015 and became AWS IoT. He is a regular speaker at industry events for IoT, AR, and VR. He has authored numerous technical publications on subjects ranging from cloud computing to augmented reality. He lives in Seattle with his wife and 5 kids and is an avid wake surfer and hockey player. Join Ben Easterling, Strategic Alliance Lead for the AT&T Smart Cities Business Unit and Steve Brumer, Partner with 151 Advisors, a leader in providing Advisory and Strategic services around “Monetizing the Connected World” for a 60 minute open discussion on Smart Cities and Smart Buildings and the commercialization aspects of them. - Where is the money in supplying products and services? With the Internet of Things and applications such as wearable personal health trackers, we are becoming more the center of our active care management. The issues of privacy and security are foundational to the safety of our healthcare data. What is the possible function of blockchain, in our healthcare industry given the numerous players such as insurance, physicians, pharmaceuticals, researchers and above all the patient where transactions such as medical care records; drug trial results may be transacted immutably on a public ledger or perhaps a ledger that is hybrid, public-private? The speaker will articulate blockchain use cases that may be considered for application in the healthcare industry. There is work in progress in this space of healthcare and blockchain, however, what must be pivotal in the discussion is that the patient remain the center of this dynamically changing universe. Education will be critical and an opportunity for this industry! Monique is President and Co-Founder of the Humanized Internet, a non-profit organization focused on providing digital identity for those individuals most underserved. Blockchain is certainly a potential mechanism for this billion-people challenge. Visit thehumanizedinternet.org for more information. The recent Southwest Airlines fatal engine failure has brought the discussion around predictive maintenance to the forefront. This webinar discusses how the intersection of two disruptive technologies, The Internet of Things and blockchain, could be applied in the development of a Predictive Maintenance As A Service solution. Scott Udell is VP, IoT Solutions at Cloud Technology Partners. He brings 27+ years of consulting and technology industry success. He has spent most of the last 15 years working in startups focused on IoT, M2M, Video Analytics, RFID, Retail/CPG/Supply Chain and Logistics. Ed Featherston is VP, Principal Architect at Cloud Technology Partners. He brings 35+ years of technology experience in designing, building, and implementing large complex solutions. He has significant expertise in systems integration, Internet/intranet, and cloud technologies. He has delivered projects in various industries, including financial services, pharmacy, government and retail. This is the hub for all things IoT-related: from 5G, WAN and Connectivity, to Smart Cities, Smart Buildings, Connected Cars, and more. Subscribe to this channel for the latest trends, technologies and market predictions from the world's biggest IoT thought leaders.